Download this insightful interview with Mann to learn more about the Internet of Things, the competitive opportunity that exists and how to take advantage of it. 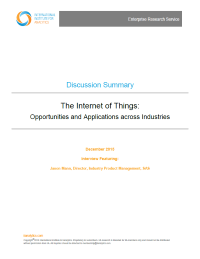 The opportunity for a broad range of industries to take advantage of the Internet of Things (IoT)—the plethora of network-connected devices that enable “things” to collect and exchange data—is here and now, according to Jason Mann, director of Industry Product Management at SAS. Still, many companies are slow to recognize and act on this opportunity.